I love it when gun grabbers prove they know nothing about basic firearm safety and don’t practice what they preach. 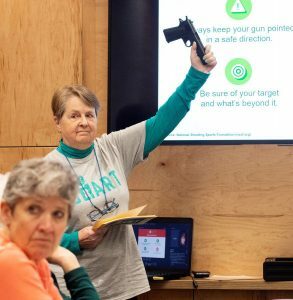 Granted, the gun this woman is holding in the picture is an air pellet gun yet she is contradicting the firearm safety rules listed directly behind her. “A new group in the Lewiston-Clarkston Valley is taking a grassroots approach to preventing unintentional firearm deaths among children by educating parents and gun owners about responsible ways to store guns. The Moms Demand Action group held its second information session Wednesday to present the organization’s BeSmart campaign message, which aims to make adults responsible for the safety of children while around guns. According to numbers presented by the group, each year in the United States nearly 300 children younger than age 18 gain access to a firearm and unintentionally shoot themselves or someone else — often fatally. Another 500 children a year kill themselves with a gun. Banta, of Lewiston, has a concealed carry permit. She helped bring the program to the valley because she thinks it offers valuable tips. As for Christie Fredericksen, also with Moms Demand Action, her family has been personally affected by gun violence. With the increased school shootings around the nation, she decided to join the organization. “It’s promoting common-sense solutions to decrease gun violence,” Fredericksen said. The United States has the highest rate of unintentional shootings in the world, according to the presenters. Around 4.6 million children in America live in homes where guns are not safely locked up or are loaded when not in use. The campaign’s message is simple. It encourages adults to take five steps to prevent child gun deaths and injuries. Those include securing guns in homes and vehicle by making sure they are unloaded and properly locked up; modeling responsible behavior around guns; asking about unsecured guns in other homes and vehicles kids plan to visit; recognizing the risks of teen suicide; and telling peers about the campaign. *It’s ironic that the Moms Demand representative would make this statement considering their financier, gun-grabber Michael Bloomberg, is spending big bucks to eliminate your Second Amendment rights.